Discussions Magazine Music Blog: ELO returns! JEFF LYNNE announces new album! ELO returns! JEFF LYNNE announces new album! (September 24, 2015) -- Known as one of the most iconic forces in music history, Jeff Lynne’s ELO is set to deliver a new album which will be the first new ELO music in 15 years. Entitled Alone In The Universe, the album is set for global release November 13 on Columbia Records. The album is available globally for pre-order Friday, September 25th. As with ELO’s previous chart-topping albums, Jeff Lynne continues to serve as ELO’s producer, songwriter, arranger, lead singer and guitarist. 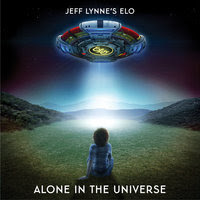 In September 2014, for the first time in 30 years, Jeff Lynne's ELO headlined BBC Radio 2's "Festival In A Day" in London's famous Hyde Park to a sold-out crowd of 50,000 fans in attendance and nearly a million people tuned in to watch. Lynne was the creative genius behind ELO which sold more than 50 million albums worldwide, had more than 20 Top 40 Hits across the U.S. and the U.K. and received countless awards and accolades. At the time of ELO’s formation, Lynne had said the goal was to create modern rock and pop songs. A goal that remains true some 30 years later with the creation of new material. “Music is such a powerful force in our lives. A good song can make people feel much less alone in this universe. And trying to create one of those songs somehow makes me feel less alone too. My whole life—from being that kid with a dream in Birmingham right until today—proves how much music can do,” said Lynne. Lynne is among the most storied names in music history having created the hit group ELO, and serving as a founding member of the Grammy Award winning supergroup The Traveling Wilburys. He has produced and collaborated with The Beatles, Roy Orbison, George Harrison, Paul McCartney, Ringo Starr, Tom Petty and Joe Walsh. In 2015, he was honored with a star on the Hollywood Walk of Fame and is an active philanthropist for organizations such as St. Jude Research Hospital, MUSICARES and H.E.A.R.T. (Helping Ease Abuse Related Trauma).